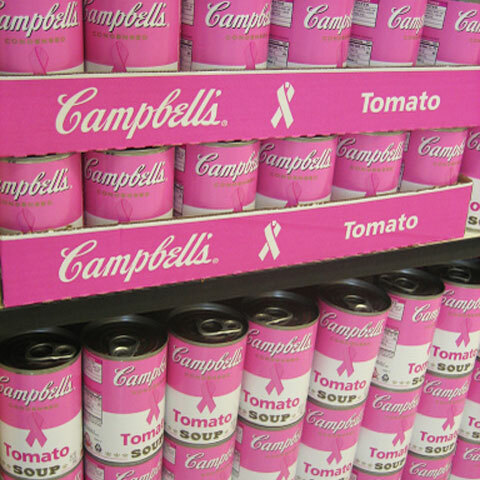 Even soup turns pink in October. As I'm sure most of you are aware, we're only a couple days into October, but Breast Cancer Awareness Month is already in full swing. Several of my favorite melanoma bloggers have beat me to it and thrown in their two cents about breast cancer and melanoma. Now let me throw in mine. If you're a regular reader (or an acquaintance who found my blog on Facebook), you may not know this: my melanoma was actually on my breast. I can't ever claim to understand what it feels like to be diagnosed with or treated for breast cancer, but I do know what it feels like to go under the knife and have a chunk of your lady parts removed. After I was diagnosed with melanoma, my dermatologist referred me to an oncologist who specialized in breast cancer. Both were hyper-conscious that I was a 23-year-old woman who didn't want to end up with lopsided breasts. Don't get me wrong--my first priority was always to get the melanoma off--but of course I was worried about losing breast tissue. I didn't have much to begin with. Today, I have a neat, three-inch scar that wraps around my right breast like a phantom underwire. Even in a swimsuit, you can't see it, but it's still there. Something I'll never forget: During a post-op appointment, my surgeon cautioned me, "Just so you're aware, women who've had melanoma are more likely to be diagnosed with breast cancer later on. I don't want to worry you. Just something to be aware of." What's the purpose in me telling you all this? Sometimes, when it comes to fundraising or allocating federal research dollars, we see a pink ribbon versus a black one. What makes one cancer any more worthy than another? Rev. 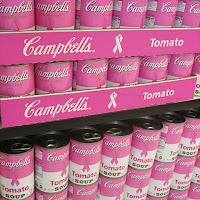 Carol Taylor wrote a great blog post yesterday that explores the history of breast cancer advocacy. She comes to the conclusion that, above all else, we all need to be in this together. Yes, we can learn from Big Pink, but at the end of the day, the women (and men) affected by breast cancer are our mothers, our sisters, and our friends. Hell, if my surgeon was right, it might even eventually impact me. All that said, please do your homework before purchasing products that claim to support breast cancer research. If you buy a "pink" lipstick, for instance, how much of the proceeds are really going to the cause? And what organization are funds being donated to? I hate to think that companies are making a profit off of cancer, which brings me back to my favorite topic in the whole entire world: the indoor tanning industry. We all know that the tanning bed industry has undergone major scrutiny by the government and the media over the past several years. Because tanning has become more widely identified as a health risk, marketing strategies have changed. Inside tanning salons, posters of beautiful women have been replaced by posters that say things like “Indoor tanning: 100x more vitamin D than milk.” Such posters are sold by lobbying groups like the Smart Tan network to help change customer’s negative perspectives about indoor tanning. Some articles on their website suggest that indoor tanning bed use can actually decrease breast cancer risk. While science has far from proven that tanning can decrease breast cancer risk—quite the opposite—by proudly selling breast-cancer-pink ribbons, salon owners are presenting themselves as sympathetic to the millions of Americans who have lost a loved one to breast cancer. My friend Al at Black is the New Pink wrote a blog post yesterday because he was outraged at the way tanning salons are leveraging Breast Cancer Awareness Month to boost sales. "This would be the same as placing your pink endorsement upon cigarettes," he said. An intelligent and thought-provoking post Katie, and thank you for sharing what you did - the relevance is startling. Thanks, Rose. You always leave me the sweetest comments :) It means a lot! This is a really great post!Thank you for sharing it! I love your blog! I followed! I would love it if you could check out my blog and follow me? Thanks so much! http://camigmakeup4u2c.blogspot.com . Awareness is one thing, but the breast cancer paraphernalia has gotten a bit out of hand. and really, what makes breast cancer more marketable than any other cancer?